We have been making this wonderful raw side dish all Summer long! It can be used along side other salads, veggies, fish and meats and is a great accompaniment for BBQs. Raw foods are of better nutritional value and therefore you eat less to satisfy your nutritional needs. The heat of cooking can deplete vitamins, damage proteins and fats and destroy enzymes which benefit digestion. As your percentage of raw foods increases, you feel satisfied and have more energy on smaller meals because raw food has the best balance of water, nutrients, and fiber to meet your body’s requirements. Including more raw foods in your diet can reverse or stop the advance of many chronic diseases, including heart disease and cancer. Remember, cooking creates free radicals, which are a major cause of cancer. When you lower the number of free radicals your cells are bombarded with, you lower your risk of cancer. As a live food, this dish can help promote better digestion so eat a bit before any cooked meats or food to start those digestive processes working early! 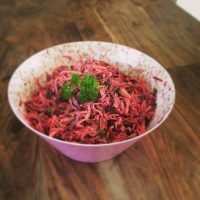 This recipe has been taken from a recent cookery workshop led by Karen Maidment (www.endibsnaturally.com) and her amazing grain/gluten free cookbook, Meals That Heal. We currently have these books for sale at the studio and online at http://www.yogaemporium.co.uk so why not pop along for your copy (and a yoga class!) and you will be inspired to cook, eat and live a little healthier! Pop the egg, mustard, salt and lemon juice into a food processor, switch it on and gradually add the oil through the funnel opening at a gentle speed. The mixture will quickly thicken. Taste the mixture and add more salt, mustard or lemon juice to your taste. Transfer to a freshly washed glass jar and transfer to the fridge or use immediately on your raw slaw veggies!